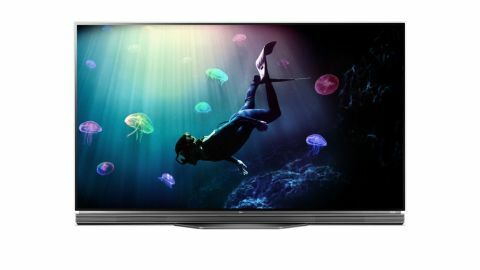 LG's latest OLED is pricey, yes, but offers exceptional clarity when given 4K HDR content and a plethora of content on its well-rounded LG Content Store. I'll keep it short and sweet: If you're in the market for a 55-inch screen with an immaculate contrast ratio, beautiful color reproduction and 4K resolution, you'd be hard-pressed finding a set better than the OLED55E6. You've read about OLED elsewhere before, I'm sure, so I won't spend much time on it here and I'll just cover the basics. In brief, OLED passes an electric current through organic light-emitting diodes to create color on the screen. Each individual LED can be individually controlled, which means there's no need to have giant lamps sitting on the side of the screen or scattered uniformly across the back of the panel. OLED screens are more uniformly lit than LCD LED screens, have a better contrast ratio and, in most cases, have richer, more natural colors, too. But why you should pick this OLED specifically, instead of say the OLED C6, G6 or B6, is because the OLED55E6 offers smart TV functionality through WebOS 3.0, a 2.2 stereo soundbar and stunning flat, picture-on-glass design for a fairly reasonable price. The 55-inch OLED E6 brings a lot to the table in terms of design. It's easy to appreciate the ultra-slim screen that's thinner than most cell phones, and the accompanying soundbar really can really kick. On the left-side of the screen you'll find four HDMI ports with HDCP 2.2 and three USB 2.0 ports, alongside composite and component in, ethernet and optical audio ports. It's also fairly hefty, and therefore might require multiple people if you decide to wall-mount it. At the core of the OLED55E6 is LG's new webOS 3.0, a fairly robust smart TV system that offers plenty of apps, including 4K versions of YouTube and Netflix. As you might expect, 4K and HDR content looks incredible on this TV with deep, inky blacks sitting next to bright, shimmering whites in perfect harmony. Contrast, OLED's specialty, is as good as it gets here. Watching Star Trek on 4K HDR Blu-ray I was often awestruck at how rich the CGI space looked and how omniscient the vastness of space appeared on LG's top-tier hardware. That said, the OLED55E6's one weakness might be the way in which it upscales content. On more than one occasion I found the lines between objects that had been upscaled was jagged, while the persistence of truMotion gave every scene a soap opera effect unless you dove into the menus to turn it off. Sound-wise, however, the OLED55E6 leaves nothing to be desired. I could spend hours going on about the ample noise it generates (the speaker goes up to 100, and I had mine set at a room-filling 12), how you can custom-tune it to your living room via a the remote's built-in microphone or how it strikes the balance between mids, lows and highs, but I'd rather focus on its other neat feature: screen casting through a function called DIAL. Similar to Google Cast, DIAL allows you to share your mobile device or laptop's screen directly to the biggest TV in your house with just a few clicks. There are other TVs with more integrated solutions out there – just look at Vizio's SmartCast series, for example – but if you're looking for crazy deep black levels and this kind of connectivity, LG's OLED is the only place to find it. Can't decide whether to go with the 55-inch version of the OLED E6 or the 65-inch version? A good rule of thumb is that if you plan on sitting within two or three meters of the TV, stick to a 55-inch screen. If you're a little ways back, opt for the 65-inch option. There's no difference in quality or functionality between the two, so it really comes down to size and budget constraints. If you're looking for similar sets from Samsung and Sony, you should consider the Sony KD-XD9305, which comes in 55- and 65-inch variations, or the Samsung KS9500 with the company's proprietary SUHD tech inside it and comes in 55, 65 and 75-inch versions. The LG OLED55E6 is perfect for a very specific audience – one that wants pristine picture quality, but doesn't necessarily need a 65-inch set, and is willing to pay a premium for it. If that sounds like you, the E6 doesn't disappoint. If you need something a bit larger for the price tag, consider stepping down one of LG's UHD sets. But if picture quality is paramount, there should be nothing stopping you from going all-in with OLED. Disclaimer: This article is based on the LG OLED65E6 review that TechRadar published in August 2016.